For fans of a certain 80s/90s movie series, the mere mention of a DeLorean speeds up the pulse. 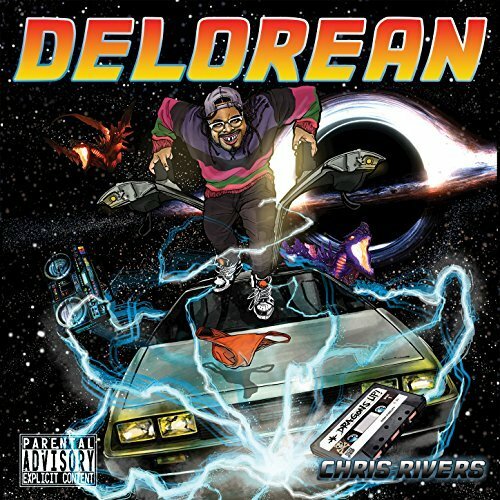 But for all its album cover throw-back and the artist’s well-known connection to Big Pun, Delorean proves that Chris River’s music is anything but a backward glance. Well-known in hip hop’s inner circle, Rivers has toured the country with world-renowned Def Jam artist Jadakiss, headlined a European tour, and opened up for Cypress Hill, Immortal Technique, Kool G Rap, and Big Daddy Kane. From the beginning of his career in 2012, Rivers made it obvious he was out to slay all mikes with a take-no-prisoners mentality that earned him the title of Cypher King. His career accolades and successes include performing in the 2015 NBA All Star Sprite Cypher, winning the Best Freestyle of 2016 by Team Backpack, and participating in the 2016 BET Hip Hop Awards Cypher, which was later featured as a Jam of the Week on BET JAMS. The album features a 21-track set of River’s lyrical spinnings that challenge the listener through detailed alliteration, assonance and allegory. The title track, “Delorean,” features Bronx artist Whispers, up-and-coming in the hip hop world himself. This song sets the tone for the album, as listeners are in for a ride as they experience life through the lens of deep musings and futuristic measuring. Infused between Rivers’ offerings are three unique “Time Zones”—quick bursts of thought from Rivers, Whispers and Oswin Benjamin that smell of impromptu slams and smoky stages. “Fear of my Crown” speaks to the past and hopes for the future in ways relatable to everyone, and the last track, “Brightness”, serves as a conscious reminder to value the self, not the trappings of Self. A lyrical dragon who breathes fire with his vocal artillery and technically efficient vernacular, Chris Rivers demonstrates that in the world of hip hop, he is truly on track to be King.